Salonga National Park spans an area of 33,350km2, which makes it the largest forest national park in Africa and the second largest tropical forest park in the world after Tumucumaque National Park in Brazil. It was created in 1970 and classified as a World Heritage Site in 1984. 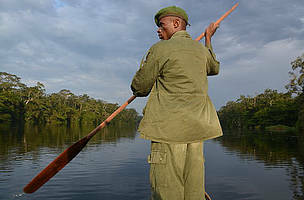 The park is the largest block of intact lowland forest in the Congo Basin and it is accessible only by water or air. 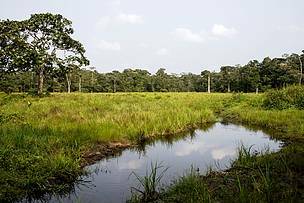 It is part of the Salonga–Lukenie–Sankuru Landscape, which extends over an area of 104,205km² and is one of the 12 priority landscapes of the Congo Basin Forests Partnership (CBFP). Almost 95% of the landscape is covered by forest: dense forests make up 70% and flooded forests and swamps 23%. 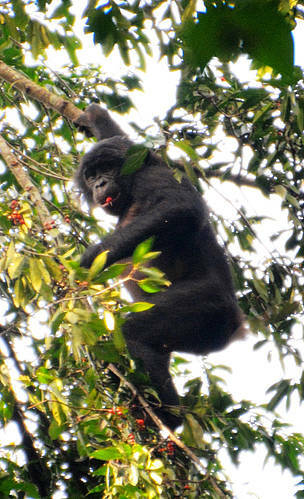 Salonga is home to a rich biodiversity, including forest elephants, bonobos, bongos, giant pangolins, and the indigenous Congo peacock. Despite the park’s enormous size and apparent inaccessibility, and the fact that it has been largely untouched by civil wars and security issues, wildlife populations have been hit hard during the past two decades. Several large navigable rivers provide access deep into the park. On the one hand, the needs of the human population in the immediate area, coupled with the huge demand for food in urban centres as far as Kinshasa, have driven bushmeat hunting and fishing in Salonga to critical levels. On the other hand, elephant poaching has in recent years once more become a highly lucrative business, prompted by the skyrocketing ivory prices on international markets. Insufficient management capacity, corruption, and the virtual lack of infrastructure have made it extremely difficult for park authorities and their partners to efficiently tackle these challenges. Since 1999, Salonga is on the list of World Heritage Sites in Danger. Salonga National Park is composed of two blocks (North and South) separated by the 45 km-wide Monkoto corridor. This is where a large number of people who resided within the park perimeter before its creation in 1970 were subsequently resettled. The density of human populations on the periphery of the park is relatively low: it is estimated to be at most 3 inhabitants per km². The landscape is populated mainly by the Mongo, who are one of the largest ethnic groups in the country, represented by the subgroups Nkundo, Ndengese, Yaelima, and Isolu. 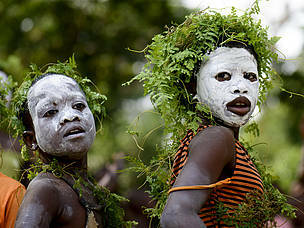 Other groups include the Mbole and the Twa pygmies. Despite the relatively low human population density, still over 600 villages are located within 50 km of the park boundaries, with main concentrations in the urban centres of Oshwe, Dekese, Boende, Inongo, Bokungu and Monkoto. Salonga is larger than Belgium and almost four times the size of Yellowstone NP. It was named after Salonga River, whose name, in turn, is said to come from the mispronunciation of a bird locally known as "nsao'loonga". 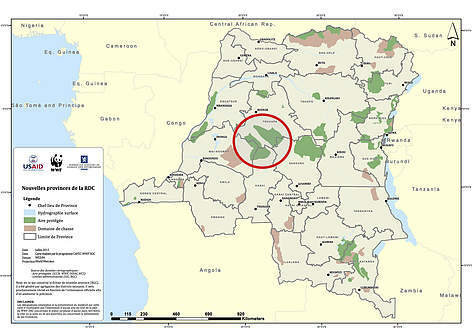 Endemic to DRC, bonobos occur irregularly over a large area, but Salonga is the only National Park in their range. It potentially holds 40% of the world bonobo population. Around 90 villages from the Monkoto corridor committed to protecting Salonga. Locals' help led to the recent arrests of two infamous poachers. WWF has been working in Salonga since 2005, supporting the Congolese park authority ICCN (Institut Congolais pour la Conservation de la Nature) in managing the park and engaging with local communities to identify and develop alternative livelihoods opportunities. Since 2004, WWF has held the lead for the Salonga Landscape programme financed by USAID firstly through CARPE (Central African Regional Programme For the Environment) and since 2013 through CAFEC (Central African Forest Ecosystem Conservation). These programmes bring together ICCN and several conservation NGOs and financial partners with the objective to preserve the ecological integrity of the humid forest ecosystem. As the Salonga Landscape provides both a vital ecological refuge for the park’s biodiversity and an important carbon sink recognized through the National REDD+ Strategy, consortium activities dually focus on scalable climate change goals and biodiversity goals, achievable through successful long-term park management and land-use planning. 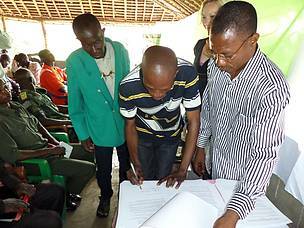 Since 2015, WWF is co-managing Salonga together with the Congolese park authority ICCN (Institut Congolais pour la Conservation de la Nature). They work to protect the park by reducing poaching and illegal trade of protected species, enhancing law enforcement, while also improving livelihoods of the people around Salonga. 1. Within the Salonga National Park the programme strengthens the park’s management to protect the rich biodiversity and ecosystem, for example by developing employees’ capacities to better manage the park, by fighting poaching more effectively, by scientifically monitoring its biodiversity and by building necessary infrastructure. 2. Around the park the programme works with communities to improve socio-economic benefits for example by creating community forests, by improving agriculture practices to increase and diversify food production along different value chains (rice, manioc, peanut, palm oil, rubber) and increasing the amount of marketable goods involving the private sector. The programme aims to showcase sustainable development at a landscape level with a thriving nature and prospering communities alongside biodiversity research still adding to our understanding of the natural world. Educate and engage institutions, communities and representatives of the private sector in sustainable use of natural resources and provide sustainable development alternatives. Develop community land tenure and alternative livelihoods programmes for communities within the REDD+ project boundary.